Background: Immunophenotyping improves both accuracy and reproducibility of acute leukemia classification and is considered, particularly useful for identifying acute myeloid leukemia (AML) with lymphoid marker expression. The incidence of the aberrant phenotypes in AML is still controversial; incidences as high as 88% have been reported. Objectives: To evaluate the occurrence of aberrant lymphoid phenotypes and to correlate their presence with various French-American-British classification (FAB subtypes), 202 cases of newly diagnosed AML were analyzed for lymphoid markers CD1a, CD2, CD3, CD4, CD5, CD7, CD8, CD10, CD19, CD20, and CD79a. Materials And Methods: Whole blood or bone marrow aspirate of 202 patients with de novo AML was collected in ethylenediaminetetraacetic acid tube and analyzed by flow cytometry using a large panel of fluorochrome-labeled monoclonal antibodies. Identification of blast cells was performed using forward scatter versus side scatter (SSC) parameters and CD45 intensity versus SSC dot plots. An antigen was considered positively expressed when at least 20% of the gated cells expressed that antigen. Results: Eighty-five patients (42%) with de novo AML expressed lymphoid-associated antigens. All AML subtypes demonstrated lymphoid-associated antigens except M7. T-cell aberrancy was the most common comprising 32.2% of the total aberrancy. The most frequently lymphoid antigen aberrantly expressed was CD7 (25.7%), followed by CD4 (22.4%) and CD19 (7.9%). Conclusion: A large number of AML cases showed aberrant lymphoid phenotypes. These lymphoid phenotypes might be associated with different leukemia subtypes. T-cell markers are more common than B-cell markers. CD7 was the most common lymphoid marker aberrantly expressed in AML. Acute myeloid leukemia (AML) is a heterogeneous disease, presenting with a high diversity of phenotypes. Immunophenotyping is essential for diagnosis and definition of particular AML subtypes such as M0, M7, and M3 variants. Immunophenotyping improves both accuracy and reproducibility of acute leukemia classification and is considered particularly useful for identifying AML with lymphoid marker expression and acute lymphatic leukemia with myeloid marker expression. The incidence of the aberrant phenotypes in AML is still controversial, and divergent results have been found by different groups, probably because of the use of a large variety of monoclonal antibody panels; incidences as high as 88% have been reported. The use of aberrant antigen expression detected by flow cytometry of AML is increasingly instrumental for diagnosis and clinical handling. The aberrant phenotypes are classified into different types: co-expression of lymphoid-associated antigens or lineage infidelity; asynchronous antigen expression, in which early antigens are co-expressed with more mature ones; or antigen overexpression and existence of abnormal light scatter patterns. To evaluate the occurrence of aberrant lymphoid phenotypes and to correlate their presence with various French-American-British classification (FAB subtypes), 202 cases of newly diagnosed AML were analyzed for lymphoid markers CD1a, CD2, CD3, CD4, CD5, CD7, CD8, CD10, CD19, CD20, and CD79a. Mixed lineage acute leukemias, chronic myeloid leukemias in myeloid blast crisis, myelodysplastic syndrome in blastic transformation, and AML on therapy or relapsed cases were excluded from the study. Two hundred and two consecutive cases of newly diagnosed AML were retrieved from the archives of Flow Cytometry Laboratory at the Bone Marrow Transplant Center, dating from January 2014 to June 2016. The immunologic profile of those patients tested by four color flow cytometry was retrospectively analyzed for the presence of aberrant lymphoid antigens expression. The samples consisted of 127 peripheral blood and 75 bone marrow specimens. The patients were 182 adults and 20 children (123 males and 79 females) with a median age of 36 years, ranging from 10 months to 85 years, including 30 cases of M0, 41 cases of M1, 10 cases of M2, 20 cases of M3, 86 cases of M4, 9 cases of M5, 5 cases of M6, and 1 case of M7 according to FAB classification. The patients' consents were obtained previously. All specimens were obtained and prepared for morphologic examination using standard techniques. Bone marrow aspirate smears and peripheral blood specimens were air dried and stained with Leishman's stain according to the manufacturer's instructions and examined under light microscopy. Whole blood or bone marrow aspirate collected in ethylenediaminetetraacetic acid (EDTA) tube was analyzed by flow cytometry using a large panel of fluorochrome-labeled monoclonal antibodies. The monoclonal antibodies used in this study included fluorescein isothiocyanate, phycoerythrin, peridinin-chlorophyll-protein, and allophycocyanin-labeled CD45, CD1, CD2, sCD3, CD4, CD5, CD7, CD8, CD10, CD11b, CD13, CD14, CD15, CD16, CD19, CD20, CD33, CD34, CD38, CD56, CD64, CD117, HLA-DR, MPO, TdT, cCD3, cCD79a, and isotype control IgGs. CD36, CD235a, and CD41a were added only when there is a suspicion of the diagnosis of M6 or M7, respectively, from the morphological examination. The antibody reagents and 12 mm × 75 mm Falcon capped polystyrene test tubes were provided by Becton-Dickinson Bioscience. For each tube, 100 μl of well-mixed, EDTA-anticoagulated whole blood or bone marrow sample and 6 μl of four-color direct fluorescent-labeled antibodies, which had to be fit together according to the detection protocol and the different fluorescence, into the bottom (according to standard operating procedure of flow cytometry laboratory and the manufacturer's instructions). Samples were incubated for 15 min at room temperature in a dark place, then 2 ml of BD FACS lysing solution was added and incubated for 10 min at dark place, then the tubes were centrifuged at 1500 rpm for 5 min, the supernatant aspirated, and 2 ml of BD cell wash solution was added to wash the cells two times. After the last wash, the cell buttons in each tube resuspended with 0.5 ml of BD CellFIX solution and subjected to data acquisition and analysis. For the detection of intracellular antigens, a permeabilizing solution was added and incubated. Then, MPO, cCD3, cCD79a, and TdT were added and incubated. Four-color flow cytometric analysis was performed using a BD FACS Calibur ™ flow cytometer (Becton-Dickinson, Bio) and FACSCanto II flow cytometer (Becton Dickinson Immunocytometry Systems, San José, CA, USA). Ten thousand events were acquired per tube to ensure the best definition of each cell population. The acquired data were analyzed using CellQuest software (Becton-Dickinson, San Jose, CA) and FACSDiva software, respectively. Identification of blast cells was performed using forward scatter versus side scatter (SSC) parameters and CD45 intensity versus SSC dot plots. An antigen was considered positively expressed when at least 20% of the gated cells expressed that antigen; however, the cutoff limit for a positive cTdT, cMPO, cCD3, and cCD79a expression was 10% or more. Discrete variables were presented using their numbers and percentage; Chi-square test was used for testing the statistical significance of aberrant lymphoid markers expression among different FAB groups. All analyses were performed using IBM SPSS Statistics for Windows, Version 20.0. (Armonk, NY: IBM Corp.) and Minitab 17 Statistical Software. (State College, PA: Minitab, Inc.), P value was considered statisyically significant if <0.05. Eighty-five patients (42%) expressed lymphoid-associated antigens (CD1a, CD2, CD4, CD5, CD7, CD10, and CD19) [Table 1]. Sixty-five patients (32.2%) expressed at least one T-lineage marker, 15 patients (7.4%) expressed one B-lineage marker whereas both T- and B-markers were expressed in 5 patients (2.5%) [Table 2]. All AML subtypes demonstrated lymphoid-associated antigens except M7. 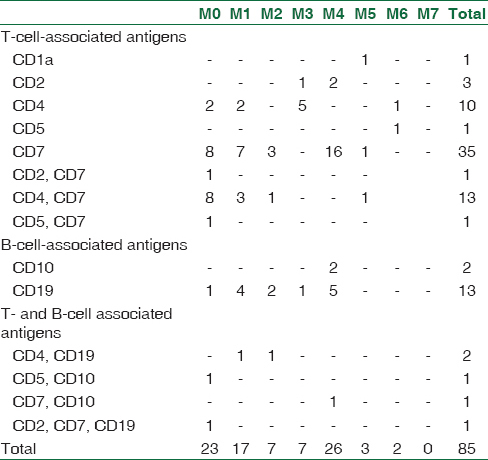 The aberrancy of lymphoid-associated antigens was most common in M0 (76.7%, 23/30) [Table 1]. 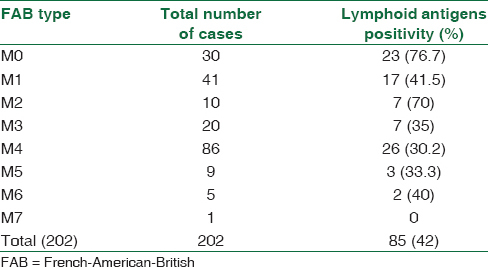 Sixty-five patients expressed single lymphoid-associated antigen (32.2%), 19 patients expressed two lymphoid-associated antigens (9.4%), and one patient expressed three lymphoid-associated antigens (0.5%). Of those twenty patients who expressed two or more lymphoid-associated antigens, 15 patients (75%) expressed T-cell-associated markers and five patients (25%) expressed both T- and B-cell-associated markers. The FAB subtypes which showed more than two aberrant markers expression were M0 [Table 2]. The most frequently lymphoid antigen aberrantly expressed was CD7 (52/202, 25.7%), followed by CD4 (24/107, 22.4%), CD19 (16/202, 7.9%), CD2 (5/202, 2.5%), CD10 (4/202, 2%), CD5 (3/202, 1.5%), and CD1a (1/202, 0.5%) [Table 3]. The expression of sCD3, CD8, CD20, cCD3, and cCD79a was not detected in any case. CD7 was observed in all AML subtypes except M3 and M6. CD1a was only seen in one patient with M5. CD2 was observed in two cases with M0; one case of M3; and two cases of M4 subtypes. CD5 was detected in two cases of M0 and one case of M6. CD10 was observed in one patient with M0 and three patients with M4. CD19 was seen in all FAB subtypes except M5 and M6. CD4 was seen in M0, M1, M2, M3, and M6 [Table 3]. AML (M0): Thirty cases (14.9%) were classified as minimally differentiated leukemia; 23 cases showed the expression of one or more lymphoid associated markers; CD2, CD4, CD5, CD7, CD10, and CD19. AML (M1): Forty-one cases (20.3%) were classified as acute myeloblastic leukemia without maturation; 17 cases showed the expression of one or more lymphoid associated markers; CD4, CD7, and CD19. AML (M2): Ten cases (5%) were classified as acute myeloblastic leukemia with maturation; seven patients showed the expression of one or more lymphoid-associated markers; CD4, CD7, and CD19. AML (M3): Twenty cases (10%) were classified as acute promyelocytic leukemia; seven cases showed the expression of a single lymphoid-associated marker; CD2, CD4, and CD19. AML (M4): Eighty-six cases (42.6%) were classified as acute myelomonocytic leukemia; 26 patients showed the expression of one or more lymphoid-associated markers; CD2, CD7, CD10, and CD19. AML (M5): Nine cases (4.5%) were classified as acute monocytic leukemia; three patients showed the expression of a single lymphoid-associated marker; one patient showed the expression of CD1a; and two patients showed the expression of CD7. AML (M6): Five cases (2.5%) were classified as acute erythroleukemia; two patients showed the expression of a single lymphoid-associated marker; one patient showed the expression of CD4, and the other patient showed the expression of CD5 [Table 1] and [Table 3]. All FAB subtypes which expressed aberrant lymphoid antigens showed the expression of two associated lymphoid markers except M3 and M6, the most commonly co-expressed lymphoid-associated markers were CD4 and CD7. They were observed in 13 out of 85 patients (15%) and can be seen in M0, M1, M2, and M5 [Table 2]. Regarding the correlation of aberrant lymphoid antigens expression with FAB subtypes, CD 7 showed statistically significant correlation with FAB class M0 (P = 0.000 1 ), CD1a was significantly correlated with FAB class M5 (P = 0.0001), CD5 was statistically correlated with M0 and M6 (P =0.011 ), whereas CD19 was significantly correlated with FAB class M2 (P = 0.008). No correlation was found with other lymphoid antigens (CD2, CD4, and CD10) [Table 3]. Immunophenotyping of acute leukemias with a large panel of antibodies, however, identifies seemingly aberrant expression of lymphoid antigens in some cases of AML, the significance of this expression is controversial. Some studies have found that the co-expression of lymphoid markers in AML is of little clinical significance. Some cases of AML which had been associated with the expression of CD7 had a poor prognosis;, other studies reported that CD2 and CD19 in AML are a favorable prognostic indicator. The purpose of this study was to analyze the pattern of lymphoid antigens expression in a large series of AML. The incidence of lymphoid antigens expression in our series was 42%, a figure comprised of the range in literature. Venditti et al. reported an overall frequency of lymphoid markers expression in AML of 41% which was very close to results of this study. El-Sissy et al. and Khalidi et al. showed that aberrant lymphoid antigens expression in AML was 47% and 48.1%, respectively, in agreement with our report. Reading et al. and Abdulateef et al. reported that a higher incidence of lymphoid markers expression in AML was 54% and 67.5%, respectively, whereas Bahia et al. and Jha et al. found that a lower frequency of lymphoid antigens expression in AML was 34.2% and 35%, respectively. Reading et al. reported that an unusual co-expression of T lymphoid and B lymphoid markers with myeloid markers was 38% and 13%, respectively, whereas Jha et al. found that co-expression of T lymphoid and B lymphoid markers with myeloid markers was 29% and 13%, respectively. Casasnovas et al. showed that 32% of patients with AML expressed at least one T lineage marker and 29% of them expressed at least one B lineage marker. In this study, T- and B-cell-associated antigens were detected in 32.2% and 10% of cases, respectively. A pan T-cell antigen, CD7, is one of the lymphoid antigens often expressed on AML cells,, and it is aberrantly expressed in 10%–40% of blasts of AML patients. Kita et al. showed that CD7 expression on AML cells is indicative not only of phenotypic but also of functional immaturity and can be regarded as a prognostic risk factor. The prognostic value of CD7 expression in AML is uncertain, and the effect on prognosis has been shown to be adverse,,,, favorable, or has no effect., In our study, the most commonly expressed lymphoid marker was CD7 (25.7%) which is identical to current report by Bahia et al., in agreement with Zheng et al. (20.5%) and is lower compared to the higher results of 37% reported by Legrand et al., 31% reported by Venditti et al., and 30.9% reported by Ogata et al. and is higher in contrast to lower values recorded by Abdulateef et al. 17.5%, 16%, and 11.8% reported by Khalidi et al. and El-Sissy et al., respectively, and 10% found by Saxena et al. CD4 is a differentiation marker in monocytic AML,, and it was considered as aberrant antigen only when expressed in cases other than M4 and M5. Excluding the monocytic leukemias (M4 and M5), CD4 was expressed in 22.4% ans was higher in contrast to lower values reported by other studies like 17.5% by Abdulateef et al., 16% by khalidi et al., 11.8% by El-Sissy et al., and 10% by Saxena et al. In this study, CD19 was expressed in 7.9% which is in accordance with other studies 8.6% reported by Bahia et al., 9.8% reported by Khalidi et al., and 10% reported by Zheng et al. In contrast to other reports which showed higher results, 34% reported by El Shorbagy et al., 14% reported by Haycocks et al., and the lower findings of 2.5% showed by Kaleem et al. The current study showed that CD2 expressed in 2.5 % of cases which is similar to that found by Thalhammer-Scherrr et al. in which the expression of CD2 was 3%; while Bahia et al and Venditti et al. found higher value 11.4% and 14% respectively. It was not restricted to M3 as reported by many other investigators such as Khalidi et al., Zheng et al. and Legrand et al. Other lymphoid markers such as CD5 and CD10 were detected in lower than 5% in agreement with the results of Zheng et al. The lower frequency of B lineage markers expression and a higher incidence of CD4 positivity in our series compared to previously mentioned publications may be related to technical issues or could be due to differences in individual laboratory protocols or due to ethnical variation or differences in the number of patients tested for those markers. This study showed that CD7 was statistically significant in M0 (P = 0.0001), and CD19 in M2 (P = 0.008) which is in agreement with Venditti et al. and Kita et al. respectively. On the other hand, Khalidi et al. did not find such correlation. CD1a was significantly positive in M5 (P = 0.0001)in concordance with Metelitsa et al., and disagreed with Thalhammer-Scherrer et al., who did not observed any positivity for CD1a in all AML cases tested against this lymphoid marker. CD5 was significantly positive in M0 and M6 (P = 0.0001). CD5 expression seems related to the AML -M0 subtype as reported by Kahl et al., Oslen et al., reported a positivity for CD5 in 5-10% of cases with M6 FAB class by immunohistochemistry while Venditti et al. and khalidi et al. did not find such correlation between CD5 expression and M0 or M6 FAB classes in their studies. The explanation of those discrepancies maybe related to the differences in the number of patients tested for those markers in various FAB subtypes in this study compared to other studies. To our knowledge, this is the first study to date in Iraq to evaluate the occurrence of aberrant lymphoid antigens expression in a large series of patients with de novo AML tested with such expanded panel of monoclonal antibodies against lymphoid antigens in a governmental sector. We conclude that, in our series, a large number of AML cases showed aberrant lymphoid phenotypes, T-cell markers are more common than B-cell markers. CD7 was the most common lymphoid marker aberrantly expressed in AML in agreement with previous studies. These lymphoid phenotypes might be associated with different leukemia subtypes that should be studied for better understanding of their biological significance. Cytogenetic and lymphoid phenotypes correlation study in the future is highly recommended to find if there is any association between specific cytogenetic anomaly and the aberrant expression of certain lymphoid marker in AML patients. Bahia DM, Yamamoto M, Chauffaille Mde L, Kimura EY, Bordin JO, Filgueiras MA, et al. Aberrant phenotypes in acute myeloid leukemia: A high frequency and its clinical significance. Haematologica 2001;86:801-6. Ossenkoppele GJ, van de Loosdrecht AA, Schuurhuis GJ. Review of the relevance of aberrant antigen expression by flow cytometry in myeloid neoplasms. Br J Haematol 2011;153:421-36. Graziani-Bowering G, Filion LG, Thibault P, Kozlowski M. CD4 is active as a signaling molecule on the human monocytic cell line thp-1. Exp Cell Res 2002;279:141-52. Bradstock K, Matthews J, Benson E, Page F, Bishop J. Prognostic value of immunophenotyping in acute myeloid leukemia. Australian Leukaemia study group. Blood 1994;84:1220-5. Kita K, Miwa H, Nakase K, Kawakami K, Kobayashi T, Shirakawa S, et al. Clinical importance of CD7 expression in acute myelocytic leukemia. The Japan cooperative group of leukemia/Lymphoma. Blood 1993;81:2399-405. Drexler HG, Thiel E, Ludwig WD. Acute myeloid Leukemias expressing lymphoid-associated antigens: Diagnostic incidence and prognostic significance. Leukemia 1993;7:489-98. Ball ED, Davis RB, Griffin JD, Mayer RJ, Davey FR, Arthur DC, et al. Prognostic value of lymphocyte surface markers in acute Myeloid Leukemia. Blood 1991;77:2242-50. Venditti A, Del Poeta G, Buccisano F, Tamburini A, Cox-Froncillo MC, Aronica G, et al. Prognostic relevance of the expression of TDT and CD7 in 335 cases of acute myeloid leukemia. Leukemia 1998;12:1056-63. Khalidi HS, Medeiros LJ, Chang KL, Brynes RK, Slovak ML, Arber DA, et al. The immunophenotype of adult acute myeloid leukemia: High frequency of lymphoid antigen expression and comparison of immunophenotype, French-American-British classification, and karyotypic abnormalities. Am J Clin Pathol 1998;109:211-20. Reading CL, Estey EH, Huh YO, Claxton DF, Sanchez G, Terstappen LW, et al. Expression of unusual immunophenotype combinations in acute myelogenous leukemia. Blood 1993;81:3083-90. Abdulateef NA, Ismail MM, Aljedani H. Clinical significance of co-expression of aberrant antigens in acute leukemia: A retrospective cohort study in makah al mukaramah, saudi arabia. Asian Pac J Cancer Prev 2014;15:221-7. Jha R, Grover G, Bose P. Lymphoid associated antigen expression in new cases of Acute Myeloid Leukemia. J Pathol Nepal 2013;3:487-90. Casasnovas RO, Campos L, Mugneret F, Charrin C, Béné MC, Garand R, et al. Immunophenotypic patterns and cytogenetic anomalies in acute non-lymphoblastic leukemia subtypes: A prospective study of 432 patients. Leukemia 1998;12:34-43. Park MH, Yang YS, Cho HI, Kim BK, Park S, Ahn HS, et al. Acute leukemias with unusual immunophenotypes. J Korean Med Sci 1992;7:377-84. Vodinelich L, Tax W, Bai Y, Pegram S, Capel P, Greaves MF, et al. Amonoclonal antibody (WT1) for detecting leukemias of T-cell precursors (T-ALL). Blood 1983;62:1108-13. Ogata K, Yokose N, Shioi Y, Ishida Y, Tomiyama J, Hamaguchi H, et al. Reappraisal of the clinical significance of CD7 expression in association with cytogenetics in de novo acute myeloid leukaemia. Br J Haematol 2001;115:612-5. Saxena A, Sheridan DP, Card RT, McPeek AM, Mewdell CC, Skinnider LF, et al. Biologic and clinical significance of CD7 expression in acute myeloid leukemia. Am J Hematol 1998;58:278-84. Fenchel K, Bergmann L, Christ S, Weidmann E, Brieger J, Mitrou PS, et al. Prognostic value of simultaneous expression of CD7 and CD33 on leukemic blasts in AML unfavorable outcome of patients with CD54+ blasts. Blood 1993;82 (Suppl 1):122a. Pillay Y, McLellan G, Davison G, Kelly S, Jacobs P. CD7 expression does not predict for poor outcome in acute myeloblastic leukemia. Blood 1995;85:3357-9. Lauria F, Raspadori D, Ventura MA, Rondelli D, Tura S. CD7 expression does not affect the prognosis in acute myeloid leukemia. Blood 1994;83:3097-8. Zheng J, Wang X, Hu Y, Yang J, Liu J, He Y, et al. Acorrelation study of immunophenotypic, cytogenetic, and clinical features of 180 AML patients in china. Cytometry B Clin Cytom 2008;74:25-9. El Shorbagy S, Haggag R, Alazizi N, Abouzeid T. CD56 and CD19 antigens expression in acute myeloid leukemia identifies patients with adverse prognosis in Egypt. IJSR 2016;5:523-30. Haycocks NG, Lawrence L, Cain JW, Zhao XF. Optimizing antibody panels for efficient and cost-effective flow cytometric diagnosis of acute leukemia. Cytometry B Clin Cytom 2011;80:221-9. Kita K, Nakase K, Miwa H, Masuya M, Nishii K, Morita N, et al. Phenotypical characteristics of acute myelocytic leukemia associated with the t (8; 21)(q22; q22) chromosomal abnormality: Frequent expression of immature B-cell antigen CD19 together with stem cell antigen CD34. Blood 1992;80:470-7. Metelitsa LS, Weinberg KI, Emanuel PD, Seeger RC. Expression of CD1d by myelomonocytic leukemias provides a target for cytotoxic NKT cells. Leukemia 2003;17:1068. Kahl C, Knopp A, Steiner B, Leithauser M, Wilhelm S, Kleine HD, et al. Rare coincidence of hypertriploid chromosome number and aberrant coexpression of the lymphoid-associated antigen CD5 in acute myeloid Leukaemia FAB M0. Leukemia 2003;17:1188. Olsen RJ, Chang CC, Herrick JL, Zu Y, Ehsan A. Acute leukemia immunohistochemistry: A systematic diagnostic approach. Archives of Pathology and Laboratory Medicine 2008;132:462-75.